For the 2016 edition, Boom have stated that only 33.333 tickets would be available, therefore, people have rushed on the First and Second tickets sale phases, which are now sold out, and Boom is only able to sell full price (180€) tickets from now on. 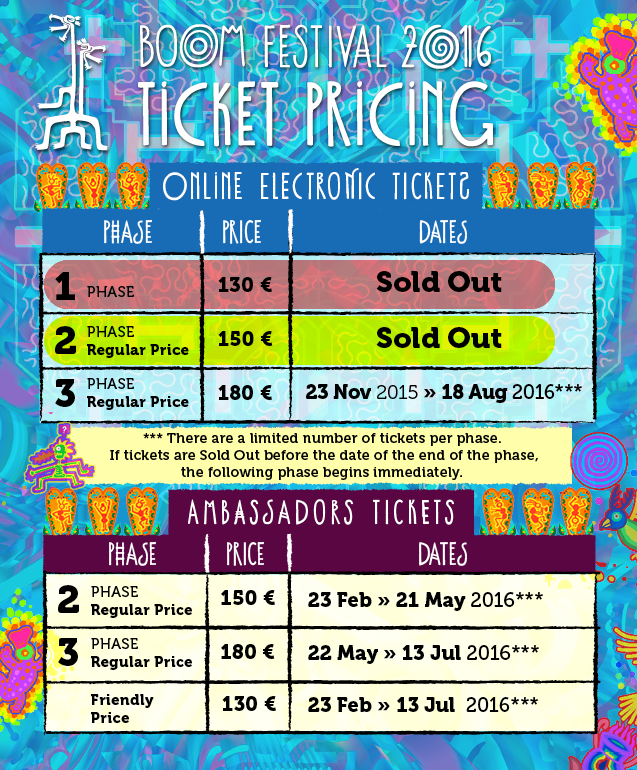 Your only chance to get cheaper tickets (150€) remain the Ambassadors, AND the good news is we'll be Ambassadors for the Boom Festival 2016 for the third time. That means you'll be able to buy some Boom tickets from our online shop...from February 23rd to July 13th 2016 ! And as expected, we're flooded with reservation requests :) DAMN! The ambassadors' list is here, and you can see there's a sales point in The Netherlands this time, so we'd be grateful if you could liaise with them if you're from these countries. In other words we'll be happy to serve future Boom attendees from Belgium (and Luxemburg, OK, OK). We gave a french phone number, sorry for that, but one of us lives in France and the other who's in Belgium wouldn't be able to answer you due to the constraints of his real life job. So, please don't hesitate to write us instead on boom@suntriprecords.com , we'll answer QUICK. By the time we have paper tickets, please don't come knocking at our address in Gent, that's our office, not a physical shop. That's why it's not on the list and why you'll have to buy from our online shop.